Five years after the Mexican government passed a controversial “education reform” law with no public discussion, teachers in the southern state of Oaxaca are still resisting its implementation. The changes imposed by the conservative government bear a strong resemblance to the goals of education “reformers” in the U.S.—closing schools, creeping privatization, punitive evaluations of teachers in order to fire them, attacks on union rights. In Mexico, however, the campaign has been accompanied by arrests of dissident union officials and even, in one case, a mass police shooting that left at least eight people dead. And also as in the U.S., Mexican teachers have put forward their own positive plan for changing the schools and their students' conditions of life—as an alternative to blaming teachers. On Monday teachers from the dissident movement La CNTE marched in Mexico City and in various states to protest the convention of their parent union, El SNTE, which has backed the government's education reforms. In the town of Juchitán in Oaxaca, teachers also demanded that their schools be rebuilt after last September's earthquake. La CNTE (the National Coordinating Committee of Education Workers, in English) is strongest in Oaxaca's Section XXII and has had some success in noncompliance with the government's plan. Oaxacan teachers have largely refused to take the national examination demanded by the government in order to weed teachers out. They say that the examination, which is purely a test of knowledge, not an evaluation of teachers' actual performance in the classroom, ignores local conditions in the schools. Wilbert Santiago Valdivieso, an executive board member of Section XXII, said the Secretary of Education offered the carrot of housing credits to induce teachers to take the test, as well as the stick of threats of firing. He asked what was the use of a national standardized test when conditions varied so widely from state to state and between city and country. Oaxaca's teachers are in favor of evaluation, he said—one that would include a broad look at all the conditions students face. “They point at teachers as the source of the problems in the schools, but the state doesn't provide the resources we need,” Santiago said. Oaxaca is one of Mexico's poorest states. Since the “reform” was passed by the Congress in December 2012, in a convention center surrounded by police to keep protesting teachers away, the national government has cut the education budget, closed schools, and refused to replace retiring teachers. Some Oaxaca teachers face up to 60 students in a classroom. The state has closed smaller rural schools and combined them with others, leaving students to walk to school up to two hours, or for parents to pay for transportation. At the same time, the government is creating opportunities for private business to profit from the schools. Under the “Escuelas al CIEN” program, businesses are encouraged to provide money for infrastructure repairs—in exchange for the deed to the school's assets. Critics such as Santiago question whether this is even legal under the Mexican constitution, which requires education to be compulsory, secular, and free. In June 2016 police opened fire on a demonstration of teachers and supporters in the small town of Nochixtlan, northwest of Oaxaca City. At least eight were killed, and more than 100 wounded, including police. No one has been charged with any crime in the killings; the government's human rights commission recommended only an apology. Meanwhile, Section XXII is promoting its own Plan for the Transformation of Education in Oaxaca. Besides more training for teachers, the plan calls for involving parents to revive traditional toys, teach about medicinal plants, create school gardens, teach math and logic, and create community libraries. The Plan would create jobs for parents in repairing and maintaining schools. Lea la versión en español aquí. 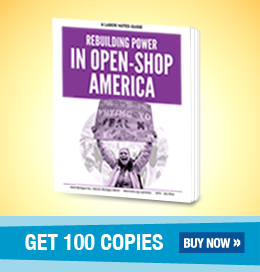 Jane Slaughter is a former editor of Labor Notes and co-author of Secrets of a Successful Organizer.